For all the developments in artificial intelligence, one of the consistently worst uses of it is with chatbots. Those little ‘Chat With Us’ side bars on many websites. Since we’re doing a lot with artificial intelligence (A.I.) in Transcriptive and in other areas, I’ve gotten very familiar with how it works and what the limitations are. It starts to be easy to spot where it’s being used, especially when it’s used badly. So A.I. chatbots, which really doesn’t work well, have become a bit of a pet peeve of mine. If you’re thinking about using them for your website, you owe it to yourself to click around the web and see how often ‘chatting’ gets you a usable answer. It’s usually just frustrating. You go a few rounds with a cheery chatbot before getting to what you were going to do in the first place… send a message that will be replied to by a human. Total waste of time and doesn’t answer the questions. 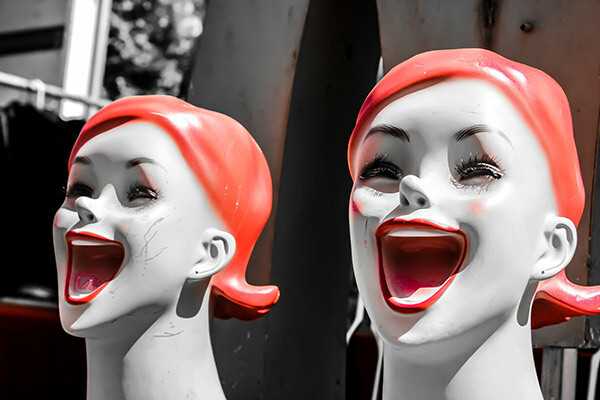 Do you trust cheery, know-nothing chatbots with your customers? A.I. is just not great at reading comprehension. It can get the jist of things usually, which I think is useful for analytics and business intelligence. But this doesn’t allow it to respond with any degree of accuracy or intelligence. For responding to customer queries it produces answers that are sort of close… but mostly unusable. So, the result is frustrated customers. Take a recent experience with Audi. I’m looking at buying a new car and am interested in one of their SUVs. I went onto an Audi dealer site to inquire about a used one they had. I wanted to know 1) was it actually in stock and 2) how much of the original warranty was left since it was a 2017? There was a button to send a message which I was originally going to use but decided to try the chat button that was bouncing up and down getting my attention. So, I asked those questions in the chat. If it had been a real person, they definitely could have answered #1 and probably #2, even if they were just an assistant. But no, I ended in the same place I would’ve been if I’d just clicked ‘send a message’ in the first place. But first, I had to get through a bunch of generic answers that didn’t answer any of my questions and just dragged me around in circles. This is not a good way to deal with customers if you’re trying to sell them a $40,000 car. I also had one threaten to end the chat if I didn’t watch my language, which was not aimed at the chatbot. I just said, “I just want this to f’ing work”. A little generic frustration. However, after it told me to watch my language, I went from frustrated to kind of pissed. So much for artificial intelligence having emotional intelligence. Getting faux-insulted over something almost any real human would recognize as low grade frustration, is not going to make customers happier. I think A.I. has some amazing uses, Transcriptive makes great use of A.I. but it also has a LOT of shortcomings. All of those shortcomings are glaringly apparent when you look at chatbots. There are, of course, many companies trying to create conversational A.I. but so far the results have been pretty poor. Based on what I’ve seen developing products with A.I., I think it’s likely it’ll be quite a while before conversational A.I. is a good experience on a regular basis. You should think very hard about entrusting your customers to it. A web form or FAQ is going to be better than a frustrating experience with a ‘sales person’. Not sure what this has to do with video editing. Perhaps just another example of why A.I. is going to have a hard time editing anything that requires comprehending the content. Furthering my belief that A.I. isn’t going to replace most video editors any time soon. We are starting to use bots in a rudimentary way in our social support space here at Adobe, so this info is valuable. So far, we don’t have any bots trying to pose as real humans. They have helped direct traffic into the right places and are working in a positive way, so far. That said, I’ll keep what you have said here in mind as we move forward. I will certainly look at how others are using A.I. a bit more carefully now. Thanks for article and insight, Jim. It’s all good if you let people know they’re helpbots or whatever. As I mention, they are useful for commonly asked questions. It’s just when you start trying to pass them off as real customer service people that it becomes a problem. I don’t think it’s a good customer experience. Of course, we’ve all had experiences where some outsourced customer service person had zero reading comprehension and knowledge. So if you’re, say, Amazon and deciding between outsourcing to humans that don’t know anything and a chatbot that doesn’t know anything, at least the chatbot is cheaper. But if you’re Audi and trying to sell a car, you’re crazy to entrust your customer’s experience with a chatbot.